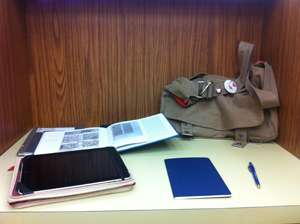 It is a bit of an understatement to say that technology has changed the way people study over the past decade. When I first started my university career, I had a Dell Inspiron 600M that I rarely took to class or used to take notes with. I can’t think of many people who did take notes on their computers — my classes were all filled with people toting pens and notepads around. I certainly did, and I still have all those notebooks. It wasn’t until the summer before my senior year, when I bought a MacBook that was easier to carry around than my Dell, that I made the conversion to electronic notes-taking, but even then I still used real books and printed out the journal articles I needed rather than using electronic resources on my computer, and for the most part I still took notes by hand (and typed them up later). When I wrote my undergraduate honours dissertation, I typed notes out of my primary and secondary sources up in meticulous Word documents and then printed them out because I didn’t like having all the windows I needed open on my screen at the same time. For my first master’s, I took my notes in class on paper (as did all of my coursemates), but tended to always take my MacBook to the Bodleian to take notes and write down quotes from the books I was studying. I think I would have continued printing out my typed-up notes if it hadn’t been for Apple’s advent of the Spaces feature in OS X in early 2008. For those who aren’t Mac users, Spaces allows you to create multiple desktop spaces and spread multiple windows across them. For me, it allowed me to have each chapter of my dissertation and its attendant notes documents open in their own separate spaces. With the advent of the Kindle and the iPad and tiny netbooks, things have changed noticeably and drastically since I left Oxford. In my new courses, the majority of students seem to be taking their notes on MacBooks or netbooks or tablet PCs. I’m sure there are a lot of advantages to using computers to take notes, and I’d love to hear some perspectives on this, but I find them distracting and I’m not alone. Personally, I feel about it the same way I feel about people eating in cinemas: lots of unnecessary and distracting noise, but that’s probably because I am far too easily annoyed or distracted by noises. Last week I went to lunch with a group of medievalists from around UT, and we were discussing the “wall” that a PC’s screen puts up in front of students that impede discussion. One of the medievalists told me that she makes students who want to use their laptops sit at the back of the classroom and keeps her TA sitting behind them so that they can ask students playing games or being distracting to leave the class. There have also been many recent articles we’ve all encountered who say that the use of computers in classrooms to take notes negatively affect a student’s ability to focus and retain knowledge. I tend to agree — there is a lot more evidence that backs up the argument that handwriting notes makes it easier to retain classroom knowledge than typing, and for me that is certainly true. But even I am treading a careful line between screen and paper: all my notes for my courses are meticulously handwritten in a notebook and colour-coded with pencils, but I have finally started to get real use out of my iPad for something other than Netflix and Fruit Ninja. 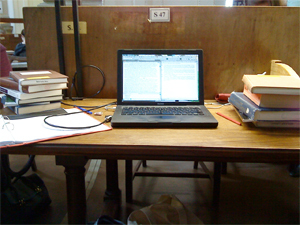 ... and my workspace in the Perry-Castañeda Library at UT in September 2011. I think there are a lot of advantages to using an iPad or similar tablet/eReader in class over using a laptop — aside from my tendency to Twitter in class, the iPad isn’t easy to surf idly or Facebook on like a laptop and so aside from scrolling through class readings or checking the syllabus, I tend not to use it very much and concentrate more on taking notes. The iPad’s biggest advantage for me is that the reading materials for my classes are (blessedly) mostly articles that my professors are kindly providing through Blackboard, so I’ve started using my iPad to download them into iBooks so that I can easily access them in class or read them on the bus. It’s a system that is really working out for me and allows me to “travel light” as I flit between campus libraries, work and class: instead of printing out reams of paper and carrying the physical articles or books around with me, I just need my iPad, notebooks, pen case and bus pass — the inside of my trusty Moop bag doesn’t change from day to day and I don’t have to worry about forgetting anything. This is a very different brave new world from when I started out at UTSA carrying my pens, binders, notebooks, textbooks and sundries around with me in a giant backpack, and even a very different brave new world from when I was at Oxford and hauling a laptop case AND a carrier bag everywhere. But in this case I think different is better — it’s certainly meaning fewer backaches! You might want to display a picture of your notebooks so that people can see the effort (and quantity of information you record in them), just a thought….